We’re honored to have Kevin Negaard guest posting for us today. He is the executive director at Sunnybrook Community Church and he has a passion for helping the church steward its resources well, including the people on staff. In mid-July of 2015, it hit me that the new ministry season was right around the corner and I was not sure we were well prepared. It seemed to me that we had not had a very good month of June as a staff. Was it ministry fatigue? Burnout? Laziness? Poor leadership? Maybe a little bit of all of those things. I knew I did not want to feel that way again. I spoke with some colleagues and staff and came up with a plan: A weeklong sabbatical for all staff during the last week of May. Our goals were twofold: to help refresh staff after the ministry season and to draw closer to God. We wanted to direct 90-120 minutes per day with prayer, reading, devotions, journaling and quiet time. Staff could use the rest of their time as they saw fit to help them reach the 2 goals we set forth. Staff could not go on a vacation — they needed to stay in town. They needed to attend church at Sunnybrook the Sunday before and after the sabbatical. We gathered on Monday morning at sunrise (5:45am) and had a time of worship. Each staff member was given “Too Busy Not to Pray” by Bill Hybels, a journal with Rick Warren’s “Quiet Time with God” guidelines, a prayer list, a musical playlist and gift certificates to Starbucks, Panera and Dairy Queen. We prayed over the prayer list each day at 9:30am. We did not come together for this prayer time but wherever we were, we prayed over the same prayer list at 9:30. We gathered on Thursday night for an hour of worship music. This was followed by pizza and chicken wings at a favorite hangout. Staff had to email their 3-5 takeaways from the experience. We collected them, discussed them as a team and will use them to better the experience next year. Some people will have to come into the office for worship practice, communication needs, janitorial and other things, so the time off will not be completely equal. Get over it — you are all receiving at least 30 hours of paid time off this week. The 90-120 minutes of directed time was appreciated and seemed to be about the right amount of time. They loved the mixture of the book, focused prayer, quiet time and journaling, the early morning Kick Off on Monday and the Thursday night worship and hang out time. Communicating with family the purpose of this week and being able to use the free time to get refreshed and draw closer to God was essential. Staff commented that having the free time and being able to decide how to spend time with family was great compared to a planned vacation where you have scheduled activities and you need to do them if you want to or not. 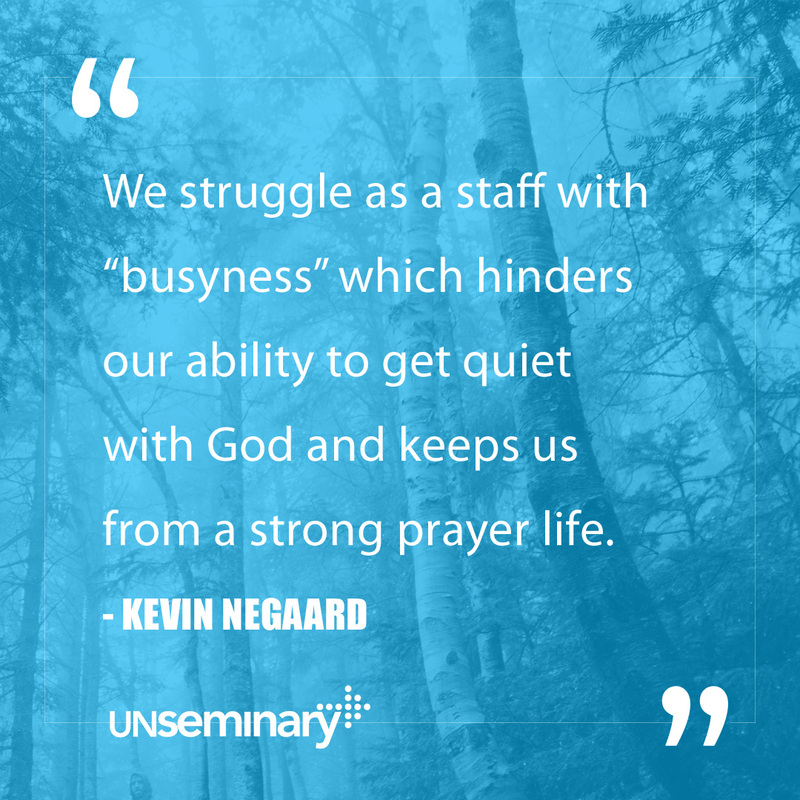 We struggle as a staff with “busyness,” which hinders our ability to get quiet with God and keeps us from a strong prayer life. We are prayerful this week will jump-start us to a better quiet time and prayer life. Our ministry staff get a half day per month for a “Spiritual Retreat.” We are looking into the possibility of adding 2 full day sabbaticals. We would have the same goals and direct part of the day. We are looking at a day in December and a day in March. This is an inexpensive event, as far as cash output, but it is one of the most appreciated gifts we have given our staff. If we believe and say that staff are our most valuable asset, then let’s show them this fact through our actions. This upcoming ministry season will give us a better picture of the value of this Sabbatical Week. From all indications, we will be making this an annual event. 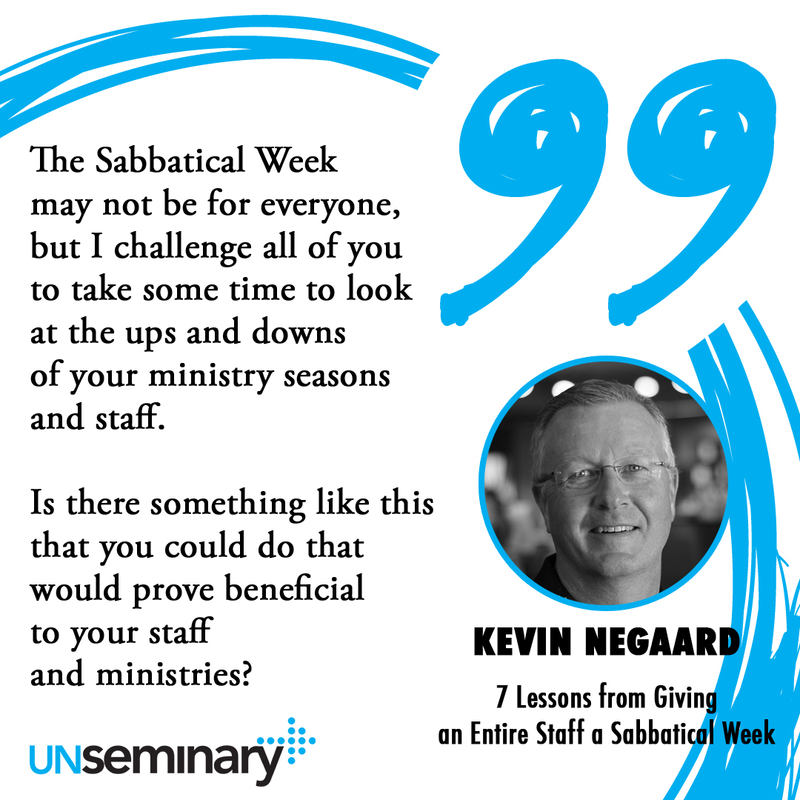 The Sabbatical Week may not be for everyone, but I challenge all of you to take some time to look at the ups and downs of your ministry seasons and staff. 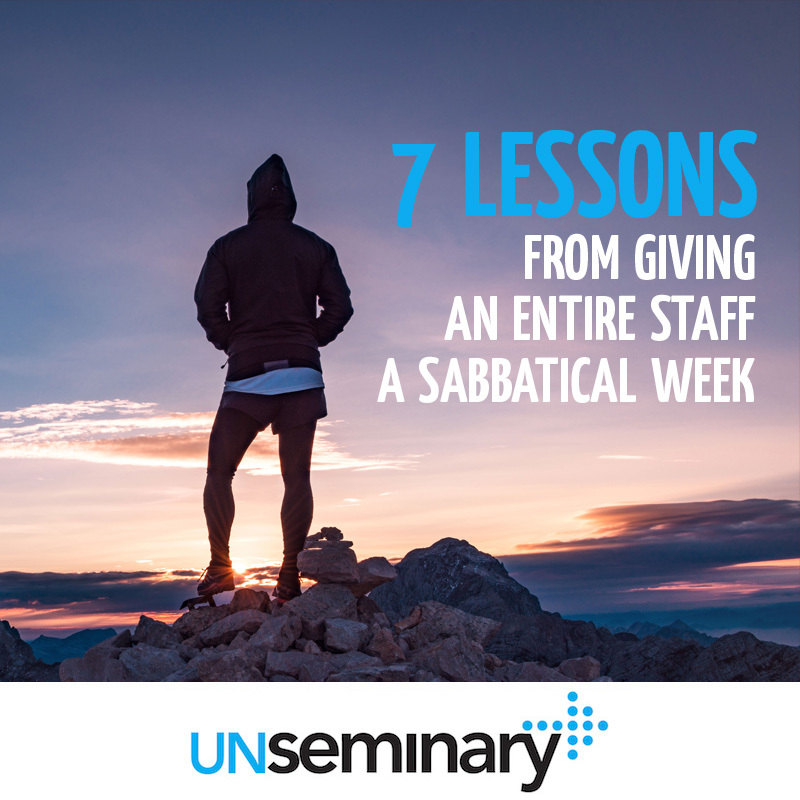 Is there something like the Sabbatical Week that you could do that would prove beneficial to your staff and ministries? About Kevin // In 2012 I felt called by God, and encouraged by the senior pastor, to apply for the executive director position at Sunnybrook Community Church. Funny thing is that I never wanted to work in a church and I was leading the search committee for that position. And here I am 4.5 years later feeling unbelievably blessed to be a part of this ministry. I graduated from The University of Iowa in 1985 and spent my entire career in medicine as an athletic trainer and running sports medicine clinics or physician’s practices before I came to Sunnybrook. I have been married to my wife, Gail, for over 31 years and have 2 married children, Matthew and his wife Briana, and Megan and her husband Aaron.